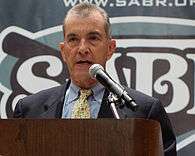 John Schuerholz (/ˈʃɜːrhɒlts/; born October 1, 1940) is the president of the Atlanta Braves of the National League. On December 4, 2016, it was announced he was elected into the National Baseball Hall of Fame and Museum Class of 2017. Before joining Atlanta, he spent twenty-two years with the Kansas City Royals organization, including nine (1982 to 1990) as the club's general manager. Among the teams he has built are the 1985 Royals and 1995 Braves, both World Series champions. His teams have also won their division 15 times. He was the general manager with the Atlanta Braves from 1990 to 2007. In 2007 he was promoted to the post of club president. Schuerholz was born in Baltimore, Maryland. He is a graduate of the Baltimore City College High School, Towson University and Loyola University. While at Towson, Schuerholz applied for officer candidate school and was rejected, as he was partially deaf. Before his career in baseball, Schuerholz was a teacher at North Point Junior High in Baltimore. Upon leaving his teaching job, he was drafted by the United States Army to serve in the Vietnam War. After entering Major League Baseball with the Baltimore Orioles, Schuerholz joined the United States Army Reserve. He donated $250,000 to Towson in 1999. This money was used to upgrade the school's baseball facility, which was named after Schuerholz. Schuerholz's son, Jonathan, was selected by Atlanta in the eighth round of the 2002 MLB draft and played in the minor leagues until 2007. Jonathan retired from baseball in August 2007 to go back to Auburn University to complete his business degree. The younger Schuerholz, who finished his six-year career in the minor leagues with a .223 batting average, was named manager of the Rome Braves (Atlanta's Class-A minor league affiliate) in 2014. After the season, Jonathan was reassigned to the Braves front office to serve as an assistant player-development director. The Baltimore Orioles hired Schuerholz in 1966 as a result of a letter Schuerholz wrote to team owner Jerold Hoffberger. Schuerholz worked under Frank Cashen, Harry Dalton, and Lou Gorman. In 1969, Major League Baseball expanded to Kansas City. Gorman and Schuerholz left for the Royals. Schuerholz was named general manager of the Royals during the 1981 offseason, and became Major League Baseball's youngest general manager at the time. Schuerholz built a strong relationship with Royals owner Ewing Kauffman, but left the team as it began to struggle. He joined the Braves in 1990, succeeding Bobby Cox who returned to the dugout to manage the team. The duo of Schuerholz and Cox produced an unprecedented run of success for the franchise, highlighted by the 1995 World Series Championship. On October 11, 2007, Schuerholz resigned as the Atlanta Braves general manager, but was promoted to club president, replacing Terry McGuirk. Schuerholz's top assistant Frank Wren was named the general manager. Schuerholz has sent many assistants to general manager positions around the league, including Wren and Braves current GM John_Coppolella. Dayton Moore, the Braves' former Director of Scouting and assistant GM under Schuerholz, has been GM of the Kansas City Royals since 2006, when he replaced Allard Baird. 1 2 3 Justice, Richard (December 1, 2014). "Schuerholz a baseball institution after almost 50 years". MLB.com. Retrieved December 1, 2014. 1 2 Bowman, Mark (July 3, 2016). "Braves embrace chance to visit with troops". MLB.com. Retrieved July 3, 2016. ↑ Ewell, Christian (July 14, 2000). "Schuerholz pays visit to `his' field at Towson". Baltimore Sun. Retrieved December 1, 2014. ↑ "What's it like being John Schuerholz's son?". Savannah Morning News. August 10, 2003. Retrieved August 30, 2015. ↑ Bowman, Mark (August 12, 2007). "Young Schuerholz retires". MLB.com. Retrieved December 1, 2014. ↑ "2014 Rome Braves Field Staff Announced". MILB.com. December 12, 2013. Retrieved December 2, 2014. ↑ Hummer, Steve (July 11, 2014). "Jonathan Schuerholz: 'I want to be the next Bobby Cox'". Atlanta Journal Constitution. Retrieved December 2, 2014. ↑ Bowman, Mark (December 16, 2014). "Braves announce Minor League coaching staffs". MLB.com. Retrieved December 17, 2014. ↑ Cooper, Jon (October 11, 2007). "Schuerholz gives up Braves' GM job". MLB.com. Retrieved December 2, 2014. ↑ McHenry, Justin (2006-03-27). "Book Review: Built to Win by John Schuerholz". Blogcritics. Retrieved 2013-11-18.